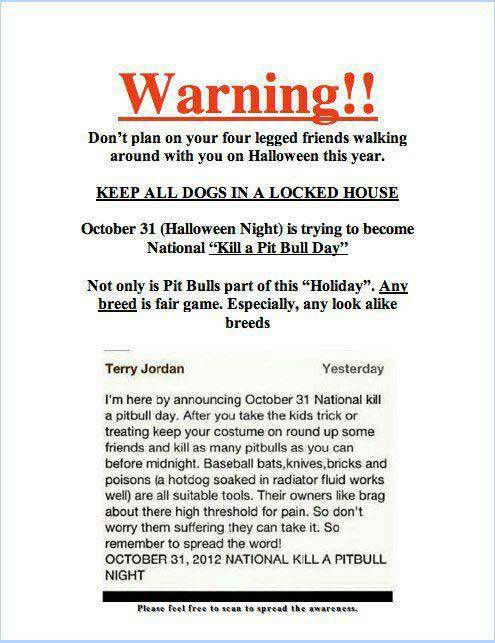 Warning message circulating via social media claims that October 31 (Halloween Night) has been designated as “National Kill a Pit Bull Day” and warns dog owners to lock up their animals because people have been instructed to go out and kill as many pit bulls and other dog breeds as possible before midnight on the designated day. The message is a hoax. 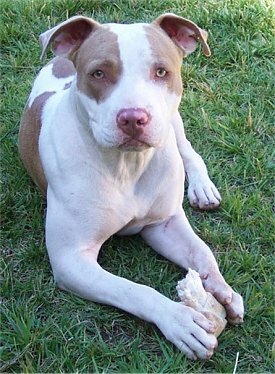 The warning is an attempt to get back at a man named Terry Jordan, a city councilman in a small Missouri town who crafted a ‘vicious dog’ ordinance that proved unpopular with local pit bull lovers. Someone created a fake social media account in Jordan’s name and posted the message. It soon spread far and wide via Twitter, Facebook and other social networks, with many recipients apparently believing the warning to be valid. This entry was posted in Bogus Warnings. Bookmark the permalink.